All available options are shown below. 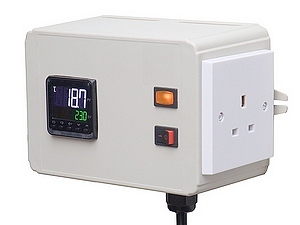 The InstCube Temperature Control 1 is a wall-mounting compact ABS plastic enclosure with an Omron E5CC digital PID temperature controller, 25A rated Solid State Relay (SSR) and a 13A mains socket. It is designed for precise control of heating (or cooling) equipment that is fitted with a standard 13A UK mains plug. These models replace our previous InstCubeABS3216LSSR model. Appearance will vary from image shown. Similar products, accessories and other products suitable for use with this product.